The Resistance! : It's Tea Time.... Donate Today! Today is the anniversary of the Boston Tea Party. In remembrance of this event which sparked the fires of revolution and liberty, those who love the constitution and want to actually follow it are donating money to the Ron Paul campaign. This will be a shot heard around the world. It’s time for us to go back to the wisdom of the founders and follow the ultimate law of our land, the constitution. 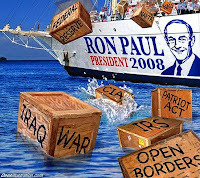 Please Donate to Ron Paul.